Get Your Western On in Golden, Colorado! Golden, Colorado is where the plains meet the mountains, and it’s one of the best get-a-way spots for National Western Stock Show visitors looking for some fresh air. Located in pretty Clear Creek Valley, just 12 miles west of Denver, this little town has long been known as the home of Coors – the largest single brewing site in the world producing a staggering 13 million barrels of beer a year (that’s roughly 4.3 billion bottles). But unlike Denver and many of the newer suburbs, Golden has never forgotten its Western roots and history. Spanning main street is Golden’s famous 58-foot long Welcome Arch, which has been saying “Howdy Folks!” to visitors since 1949. Right under the arch is the Buffalo Rose, an institution that has been a hotel, a saloon and a swimming pool since 1859. Generals Grant, Sherman and Sheridan all stayed here. Today, the Buffalo Rose offers some of the best live country music on the Front Range, or as they like to say, “it’s where food, drinks and live music are Golden.” And the Buffalo Rose is just the beginning. 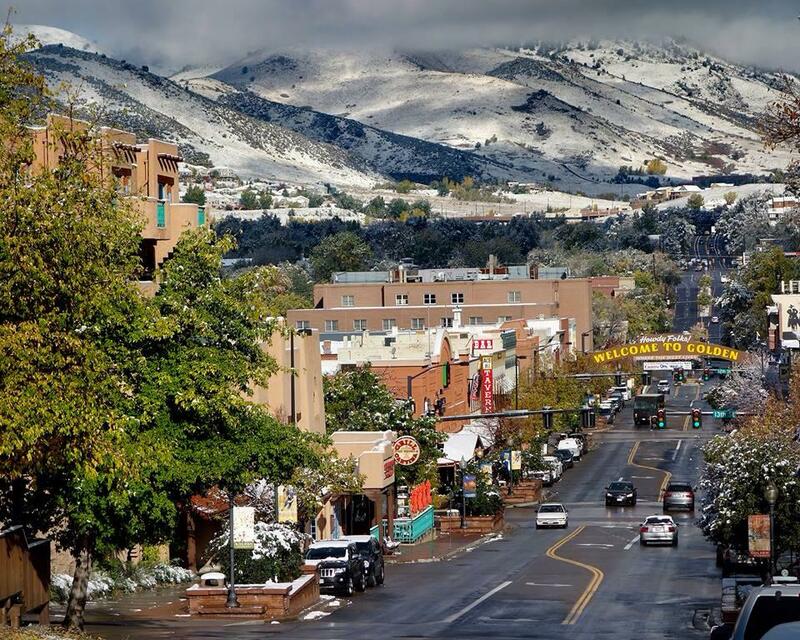 Golden’s “Old West” style main street is lined with historic buildings that now house Western art galleries, breweries, a distillery, restaurants, one-of-a-kind shops, cafes, outdoor sporting goods stores…and there’s even a Starbucks! The most famous character of the Wild West, Buffalo Bill Cody, is buried in Golden, high on top of Lookout Mountain with panoramic views and a fun museum next to the grave site. Colorado’s largest collection of steam locomotives and model railroads is here at the Colorado Railroad Museum. Or walk along the Clear Creek Trail past the old 1878 Pearce Ranch homestead. Eight children were raised on this ranch and you can tour the barn, farmhouse, outbuildings and even feed the chickens, all in a pretty creek-side location right in the heart of the historic downtown. Here are some events and things to do during in Golden during the Stock Show. This colorful, musical festival celebrates cowboy heritage and entertainment, which grew from the traditions of cowboys sitting around the campfires at night during the great cattle drives of the American West. It’s an artistic link to the past, where a handshake was your word and the Code of the West meant living a life of integrity and respect. It’s also a lot of fun with music and laughs mixed with some authentic Western History. Staged at the American Mountaineering Center in downtown Golden. Well, of course, real cowboys drink beer, and Coors is the official beer of the National Western Stock Show. So come on out and have three free beers on Coors! The brewery has a free, 30-minute, self-paced tour of the malting, brewing and packaging of Coors Beer. You get to explore a room full of giant copper kettles and then stop in the packaging room, where thousands of cans and bottles whirl by, marching one-by-one on tread mills to be filled with beer and slotted into six packs. After the tour, those 21 and over can sample three free glasses of Coors, Colorado Native, George Killians Irish Red and other Coors beers. Cowboy Tip: If you already know how beer is made, ask for the “short tour,” which is no tour at all. They’ll direct you straight to the free tasting room and gift shop. Buffalo Bill Cody was the most famous character in the history of the American West, a buffalo hunter, Pony Express rider, and scout for the U.S. Army, and the showman who essentially brought the West to the rest of the world. Starting in 1883, his Buffalo Bill’s Wild West show was performed in more than a thousand cities in 12 different countries. Bill brought along 640 cowboys, Indians, Vaqueros, ropers, trick riders, and sharpshooters, making his show more than 10 times the size of Beyonce’s 2016 World Tour. A version of his show takes place at the National Western every year. Sadly, Buffalo Bill was visiting his sister in Denver in 1917 when he died. His funeral on top of Lookout Mountain was the largest in Colorado history. Today, a fun museum near the grave brings his incredible story back to life with costumes, guns, artifacts like Chief Sitting Bull’s headdress, posters and pictures from the show. On display through the Stock Show is a medal given to Annie Oakley by British Queen Victoria, along some of her rifles and guns. There’s also a silver dollar with a hole through the center put there by sharpshooter Buffalo Bill himself. The drive to the grave site on top of the mountain begins in historic downtown Golden on the Lariat Loop Trail. This is a white-knuckle thriller, with cliffs on every turn (and no guard rails), but the view from the museum’s outdoor deck is worth it. It was the railroads that won the West, and there’s nothing like hearing a steam whistle echo off the mountains, especially in January where the cold air makes the billowing mountain of steam rise that much higher into the mountain air. The Colorado Railroad Museum has a half mile circle track – sort of a giant’s toy train set – on which they run steam locomotives and the famous Galloping Goose – a 1928 Pierce Arrow limousine put on train wheels with a bus welded on the back. It’s the only way to fly – on wheels. During the Stock Show, the museum will have two special exhibits – the Trains of the National Western, detailing the strong connection between railroads and the Stock Show, and a special on the Train of Buffalo Bill’s Wild West. Bill had a 52-car special to move his show that was so efficient loading and unloading, that the Germans studied the process before World War I.